Shopping for Doctor Who Car Accessories? Travel through traffic with the Doctor! Awesome Doctor Who License Plate Frame from Bif Bang Pow! Reads "Doctor Who - My Other Car Is A TARDIS"! My other car Is a TARDIS. Travel through time and space with the Doctor with this awesome Doctor Who License Plate Frame from Bif Bang Pow!. 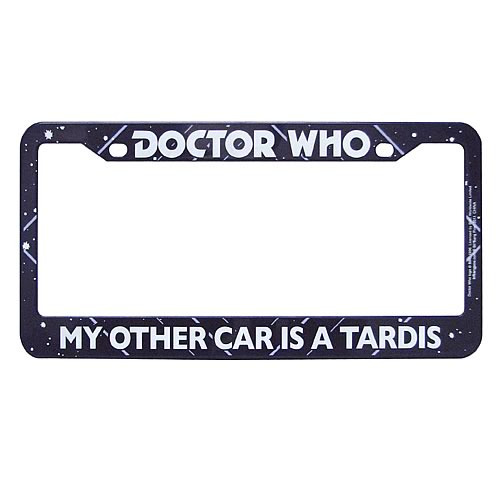 The standard-size plate holder measures approximately 12 1/4-inches wide x 6 1/4-inches tall, is made of injection-molded plastic, and features printing that says "Doctor Who" across the top and "My Other Car Is A TARDIS" across the bottom!